The exhibition which showcases a collection of artworks by Mr. Tanavoli’s students is intended to define the concept of uselessness in arts. “The artworks made over this 2-month intensive educational course are a combination of art with either industry or machine. In modern life machines have a major role to play and can be a source of inspiration. It’s worth noting that we did not seek to find machines with useful functions. Far from that; we planned on creating useless machines,” Tanavoli said. “I supervised the whole project and Ms. Mona Pad, a graduate in industrial design, was in charge of all technical matters and the implementation of the project. In fact, she helped artists with the choice of machine structure and power,” he added. “Such artworks are new in Iran. However, for five decades, artists elsewhere in the world have adopted machines in their works and injected mobility into them. 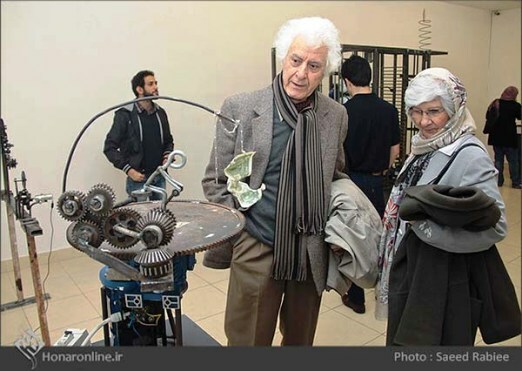 We have done this project to take the first step in this field, letting Iranian visitors get familiar with moving sculptures whose movement is aimless,” he stated. Among artists contributing to the exhibition were Farish Alborzkouh, Kourosh Ameri, Leila Taheri and Amir Mousavizadeh.